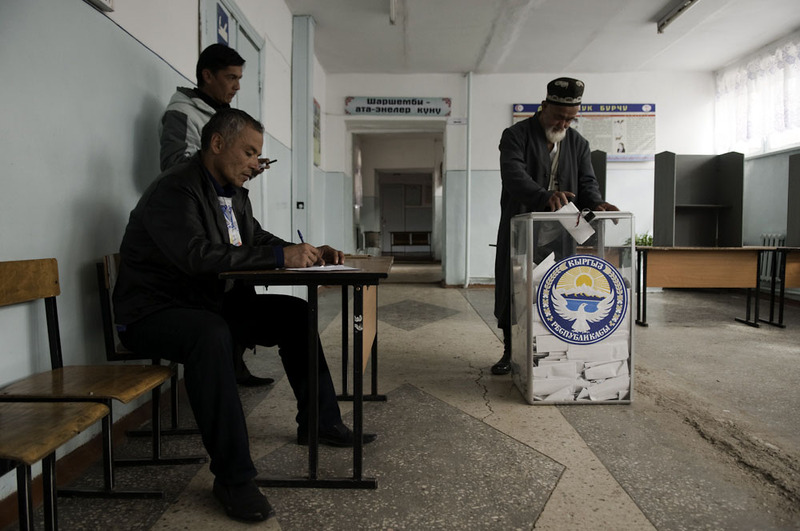 Election observers from various parties and organizations watch a man drop his vote into a ballot box. 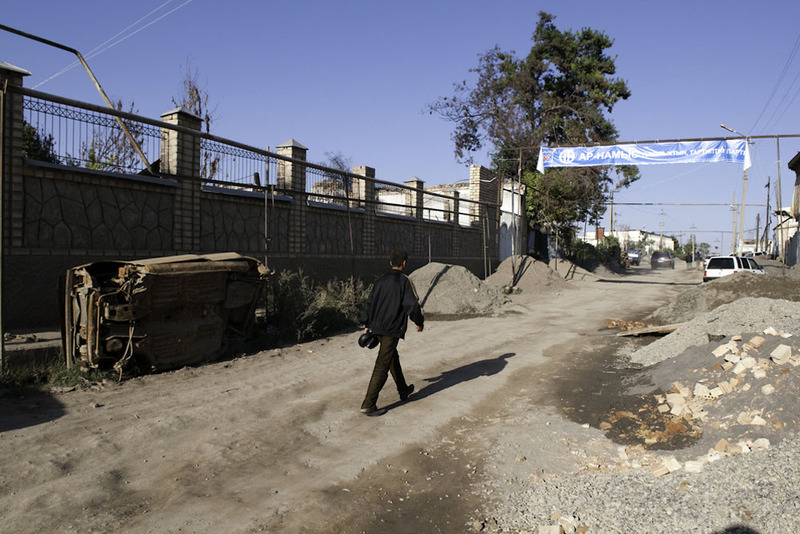 A banner for the Ar-Namys party hangs across one of the main roads running through in the ethnic Uzbek Sharq neighborhood. 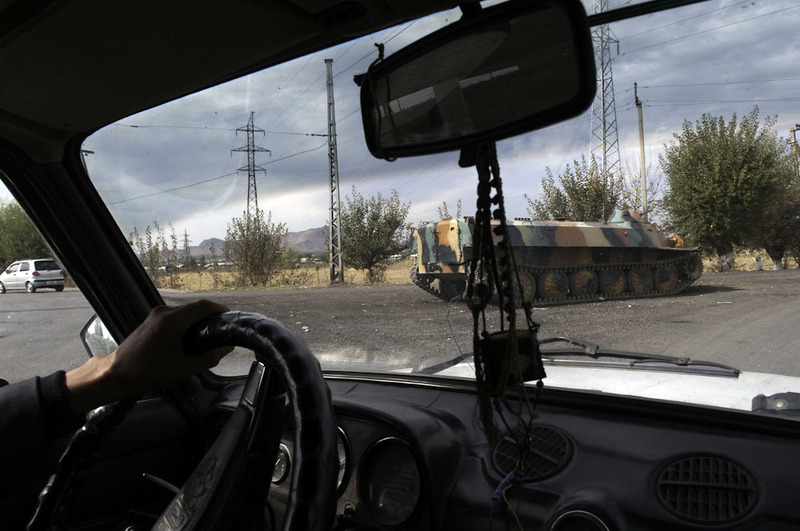 An armored personnel carrier is posted at a major intersection leading into Osh. 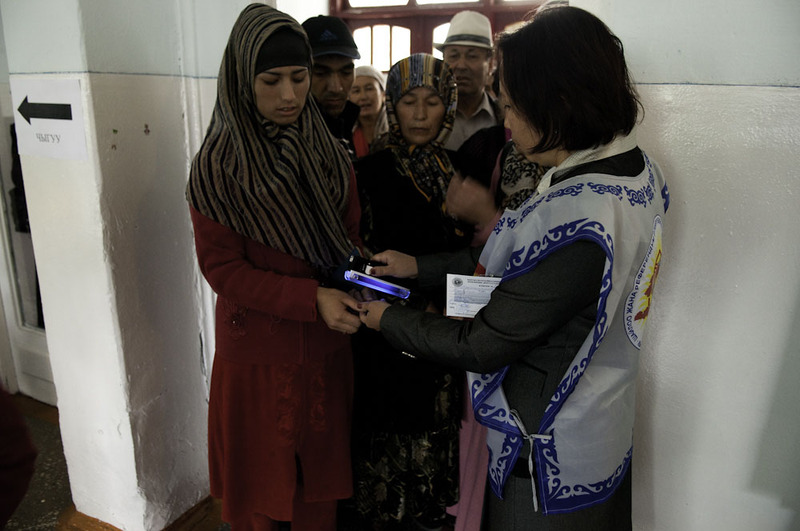 Women sign in to have their documents checked and receive a ballot. With Islamic holy site Suleiman Too in the distance, traffic flows past a political campaign sign stretching across a road. 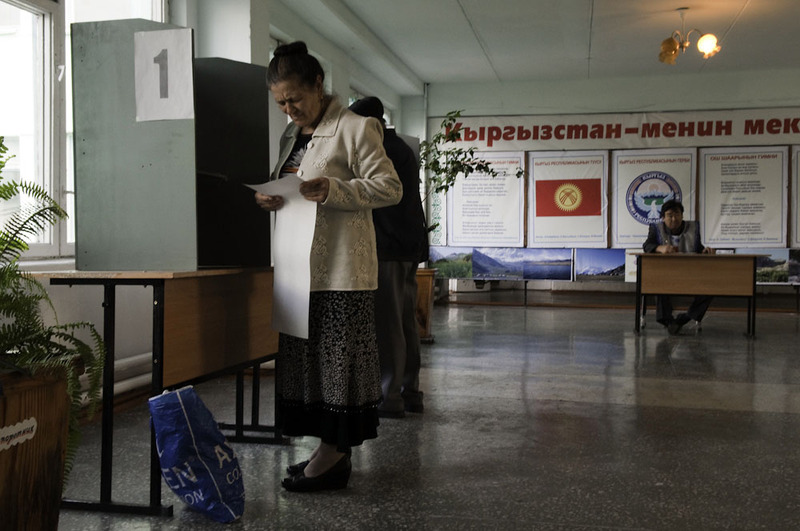 A women looks at the long ballot featuring 29 parties at a polling station in the Yuri Gagarin primary school. 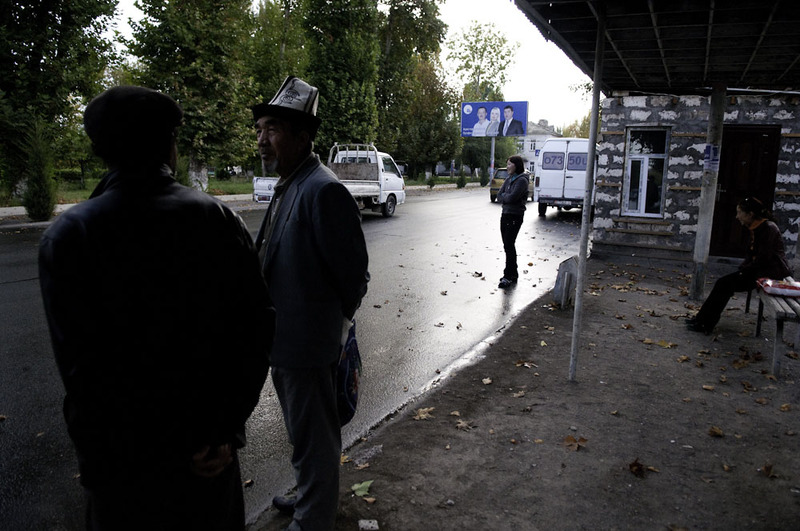 An ethnic Kyrgyz man and other passengers wait for a bus near a campaign billboard for the Ata-Jurt party. 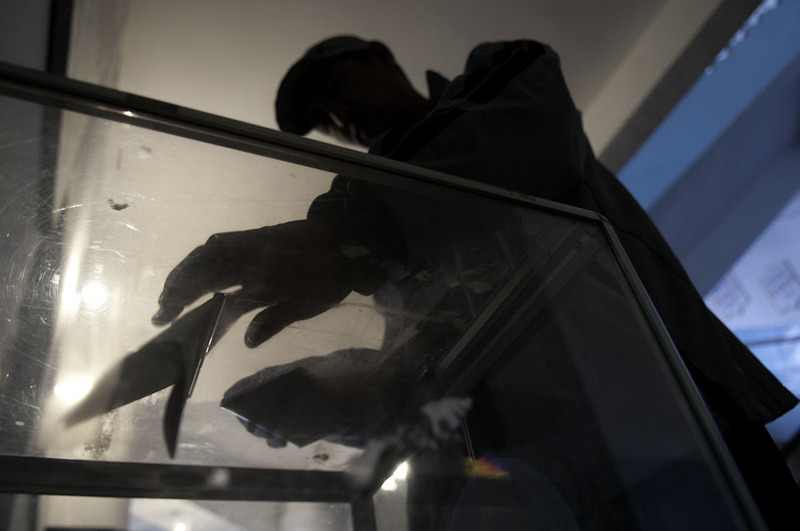 A man drops his vote in a transparent ballot box at a polling station in Osh. 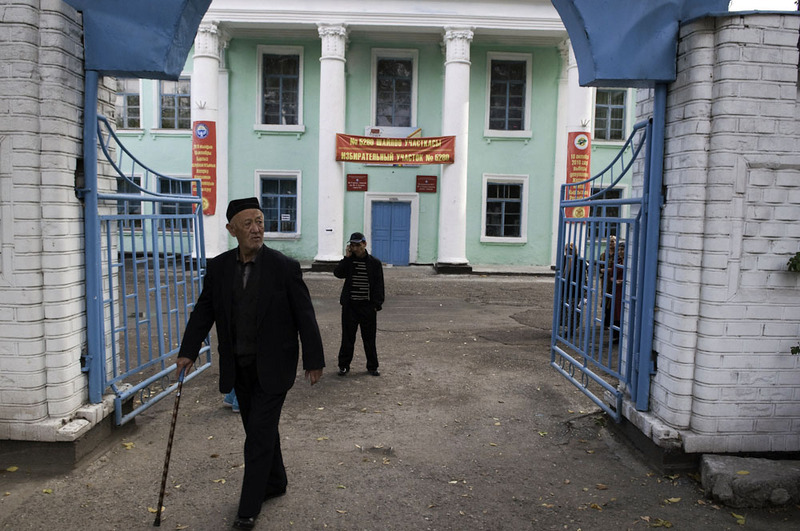 An ethnic Uzbek man leaves a polling station after voting. 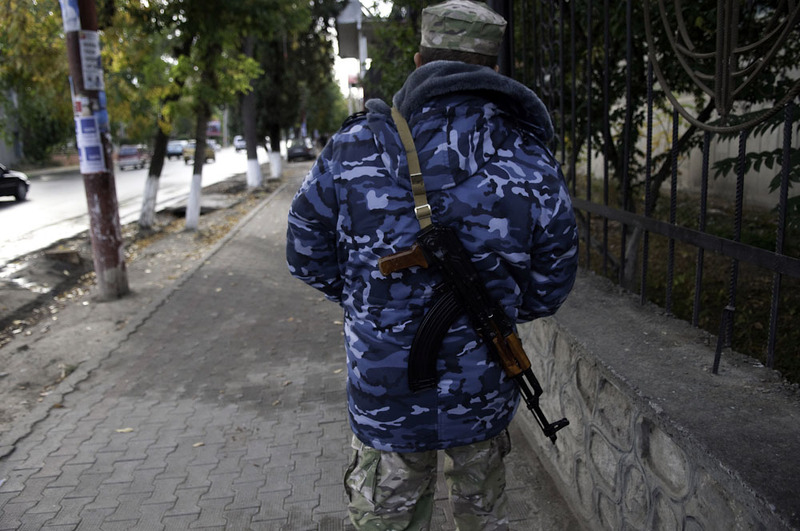 An armed security guard carries a Kalishnikov on the streets of Osh. Voters fill out their ballots at a polling station near the regional administration office. 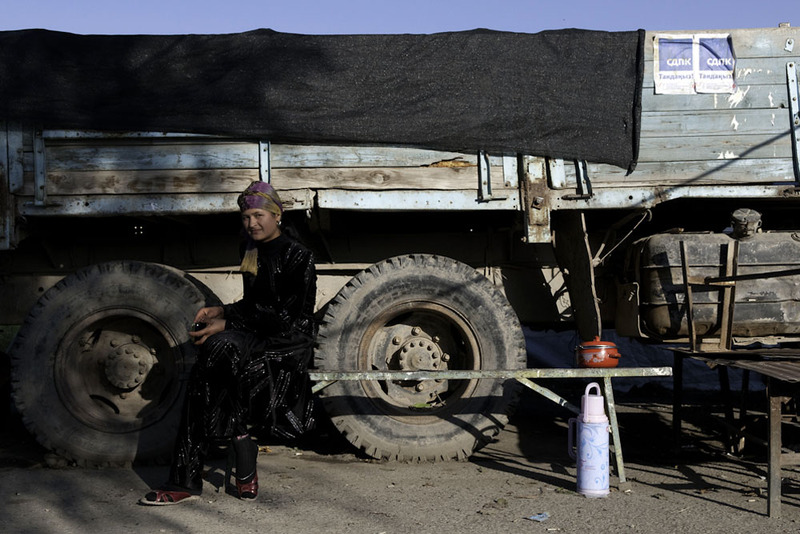 A young ethnic Uzbek woman rests near an unused truck pasted with signs of political parties. 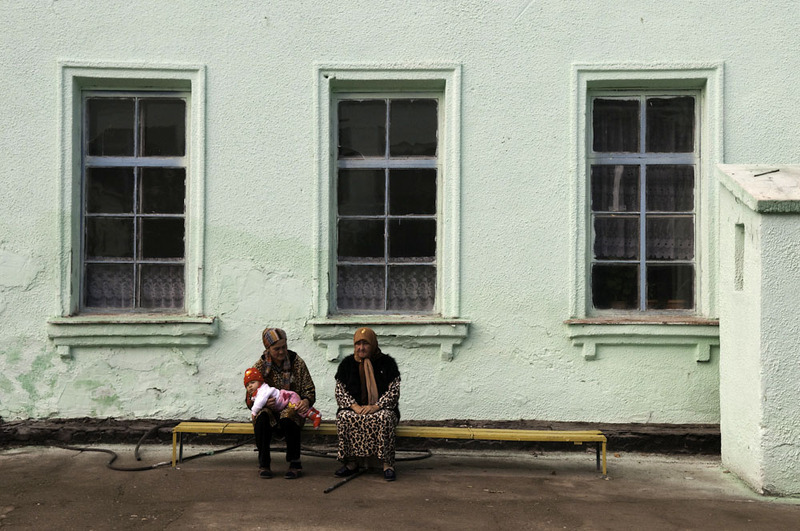 Ethnic Uzbek women wait for relatives outside a polling station after having cast their ballots. 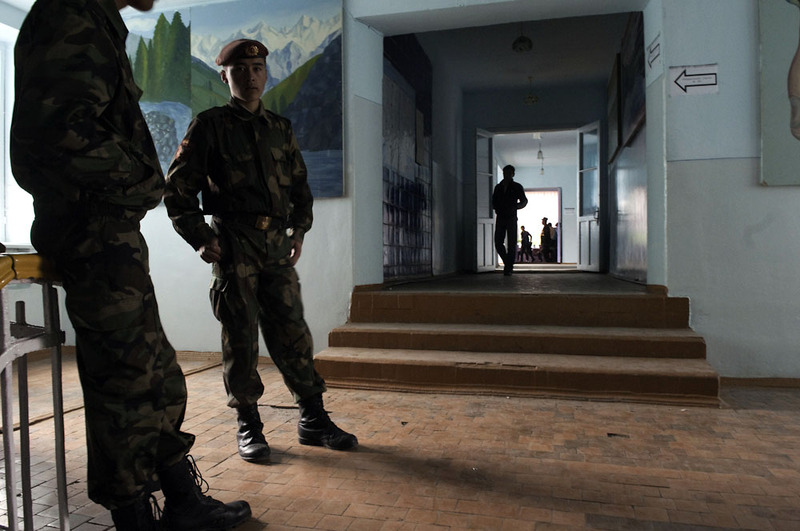 Security guards the entrance to a polling station in a public school. 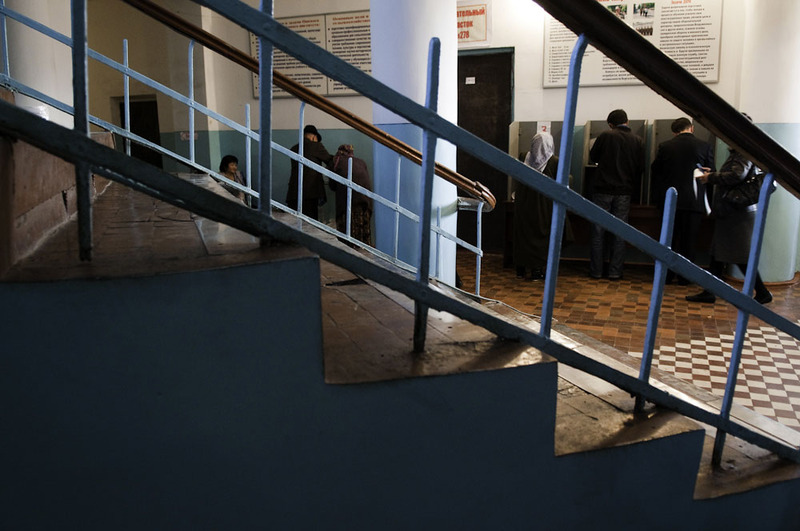 An election worker checks the thumbs of voters to make sure they have not already cast a ballot. 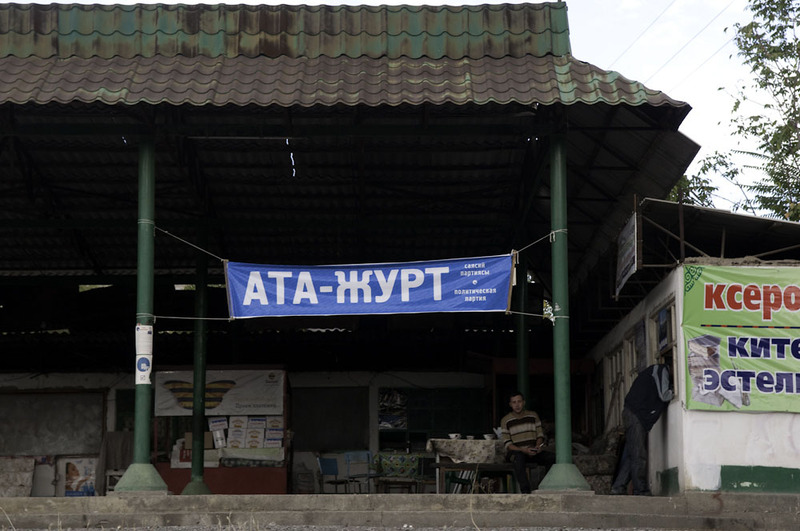 A man sits in a cafe under a campaign banner for the Ata-Jurt party. 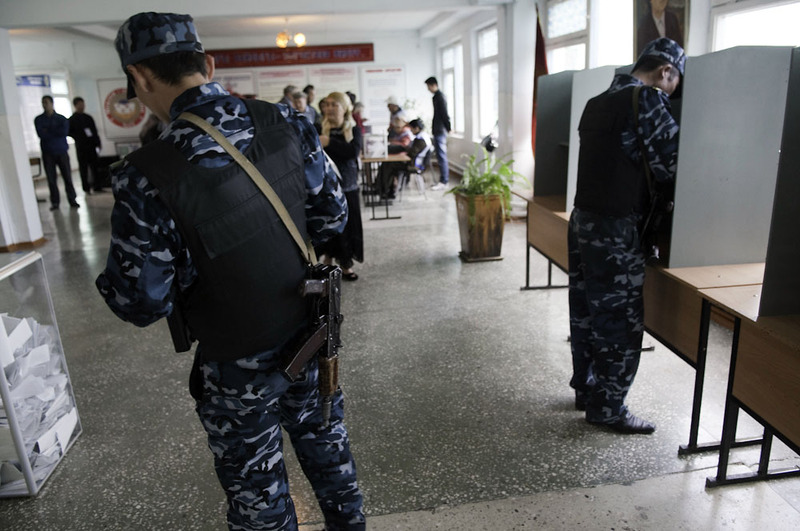 Armed security guards vote at a polling station in the Yuri Gagarin primary school. 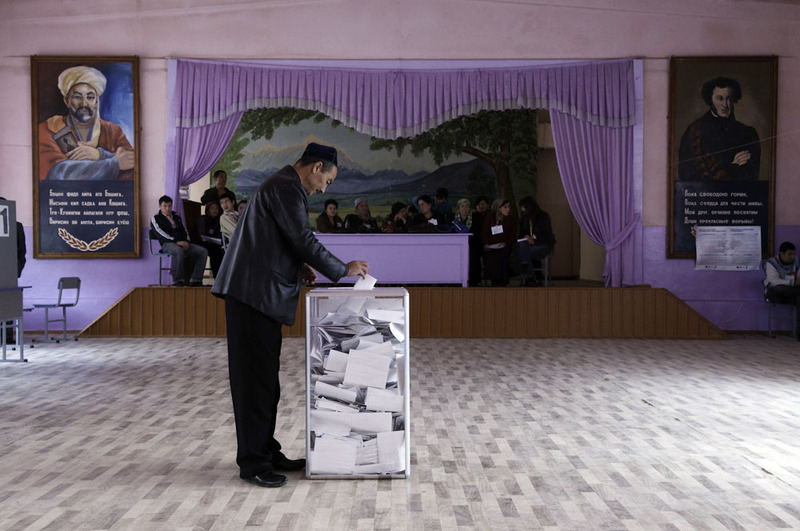 An ethnic Uzbek man drops in his vote at a polling station in the village of VLKSM near Osh. 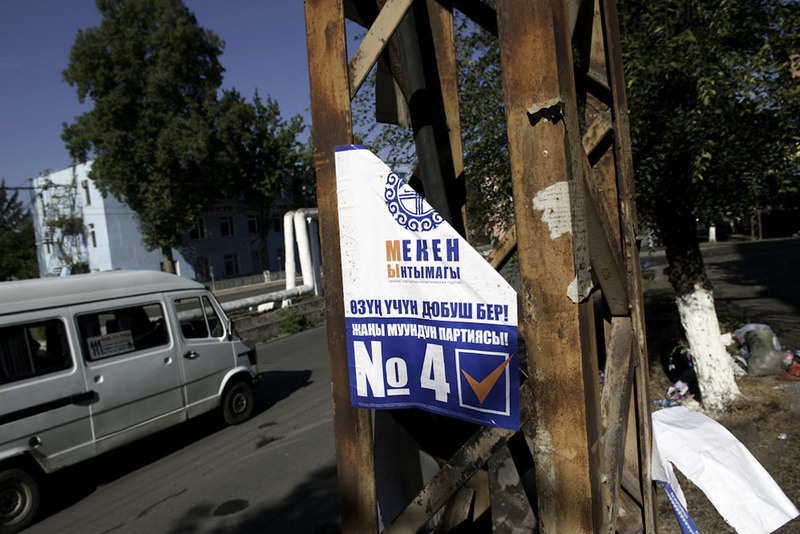 Traffic flows past political campaign flyers pasted on a rusting powerline pole in central Osh. 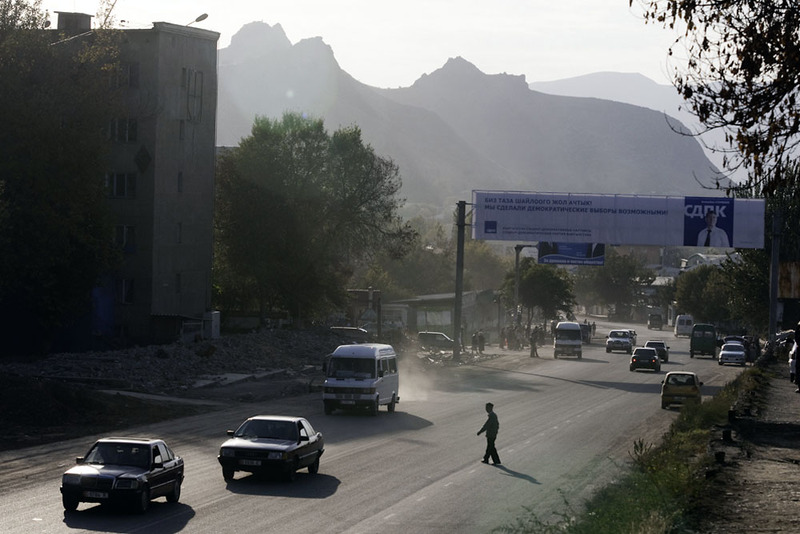 Armed security forces patrolled the streets and armored personnel carriers parked at key intersections in Osh on October 10 as voters went to the polls to elect their first parliament since June's ethnic violence, which pitted ethnic Kyrgyz against ethnic Uzbeks, in the country's southwest. Turnout in many of the city's polling stations was so heavy that several of the clear ballot boxes were already full by late morning. 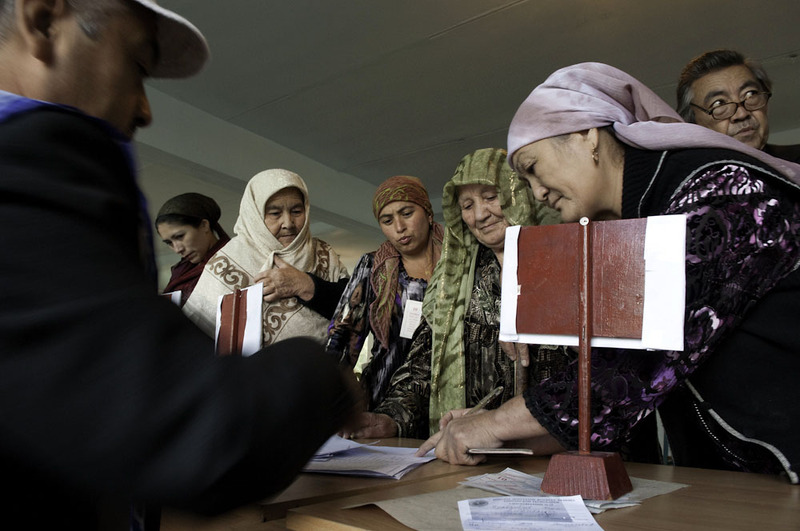 Despite fears of possible conflict, Osh remained quiet while women in colorful silk scarves and men wearing traditional Kyrgyz and Uzbek hats dropped the completed ballots featuring 29 parties into sealed containers bearing the national symbol of the Central Asian country.